A potato (Solanum tuberosum) beyond its prime that we had tossed out into the compost box awhile back decided it was the best thing that had ever happened to a tuber. 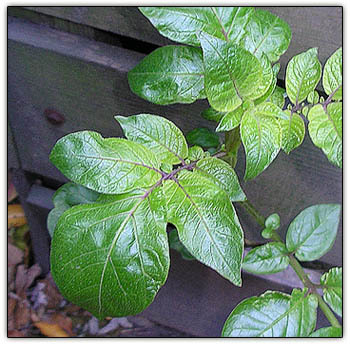 Check out our earlier post about its awesome family, Solanaceae, that "has fed us, poisoned us and lent us nicotine highs and lows for centuries." We first noticed Jack-and-the-Beanstock tendencies a couple of weeks ago when a tall, etiolated stem with tiny leaves appeared on top of the heap inside the box. Then, today, we noticed another branch had escaped into the light and was making up for lost time. Don't tell Valerie, head honcho of the wonderful Washington Park Florist who usually does all our party centerpieces and wows our guests thereby, but lots of good florists' materials are growing right here in our own back yard and neighborhood, free for the taking. All it takes is a shopping bag, a pair of clippers and a sharp eye. The wallpaper-like image above was the "happy accident" left over on the kitchen counter after we trimmed off bits of our collected flora for the centerpiece, lent magic by the peach-orange light and pale lavender cast shadows of a late-afternoon sun. 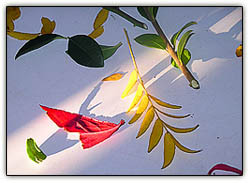 Yellow is Honeylocust (Gleditsia triacanthos inermis), red is Winged Euonymus or Burning Bush (Euonymus alatus) and green is Common Privet (Ligustrum vulgare), each overused and often aesthetically abused in the landscape trade because of their totally excellent qualities of color, form and horticultural adaptability. After bagging a few bits of local flora -- not to mention 61 cents in street coins -- during walkies, we started trimming and placing them artfully upon a terra cotta saucer as the center of gravity. 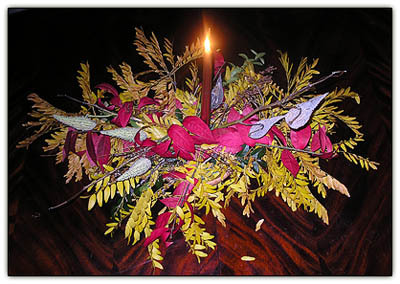 The finished centerpiece with lit bronze metallic candle brings forth jaw-dropping "Wows" from Tuck. It's looking good. We took a picture just in case the whole thing deciduates and loses all color before it takes its place center stage at the triple birthday feast at Goomp's tomorrow noon. But we're thinking the color -- and the disconnections of the leaves from the mother plant -- should hold, as fall color by definition signals a leaf's having abscised and lost contact with the mother tree or shrub. As we were telling our sis, the plants essentially made the arrangement themselves. We simply laid [don't you love it when someone uses the word "laid" correctly?] the boughs of each tree or shrub mentioned in the "wallpaper" caption above horizontally left and right on the ceramic saucer. Then we "bumped it up a notch" by adding a few sprigs of the fruiting flower stems of the highly cultivated Coral Bells (Heuchera micrantha 'Palace Purple') and some totally awesome pods of the shamelessly weedy Milkweed (Asclepias syriaca). Martha Stewart was right. "It's a good thing." Like Sisu says "Beauty in unexpected places".